Nurses Karlin Crombie, Ciara Clancy and Michelle Brady at the picket line outside the Mater Hospital in Dublin on Wednesday. NURSES ARE SET to meet over the weekend to discuss the possibility of holding strikes on further dates other than the ones already announced, as the industrial action over pay and conditions heats up. The Irish Nurses and Midwives Organisation (INMO) said it would meet tomorrow to discuss the possibility of further strikes. Nurses and midwives held their first 24 hours of a full strike on Wednesday this week, with further industrial action scheduled for 5, 7, 12, 13 and 14 February. 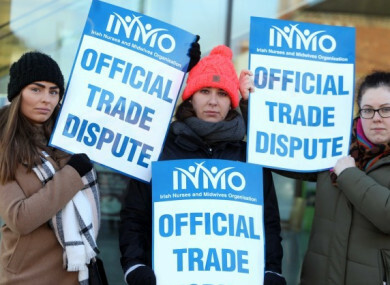 The INMO – which has over 40,000 members – announced strike action earlier this month. In a ballot held in November, over 90% of members that were polled voted in favour of industrial action. Nurses have argued for measures to deal with what they called the recruitment and retention crisis among members. They said that increasing nurses’ pay was the only way to retain nurses, and that this in turn would improve working conditions. The government has said it will not countenance any pay rises for nurses outside of the broader public sector pay agreement reached last year. It has steadfastly refused to budge on this position. The INMO said that its Executive Council would be meeting tomorrow to discuss ramping up the action beyond the dates already announced. “The government still has not made any serious proposals to avert further strike dates,” the organisation said in a tweet. “Nurses and midwives do not want to be on strike for one minute, let alone several days. But sadly we have been forced into this position by a government which refuses to listen. The government has come in for strong criticism over its stance on the nurses’ pay claims. A recent Claire Byrne Live/ TheJournal.ie poll carried out by Amárach Research of 1,000 adults found broad support for the nurses’ action. When questioned whether they supported the planned 24-hour strike by nurses and midwives, 74% of respondents said yes. Fianna Fáíl criticised Taoiseach Leo Varadkar yesterday over his comments on the strike, saying he was “acting as a commentator once again”. Email “Nurses to meet tomorrow to discuss adding further strike dates”. Feedback on “Nurses to meet tomorrow to discuss adding further strike dates”.